Frank Castle fans will find plenty of familiar faces in the new Netflix original. Step aside, Defenders. The next Marvel-Netflix collaboration requires nothing more than an army of one. With that said, Marvel's The Punisher isn't coming with a single bullet in the chamber, no matter how impactful that bullet might be. The new series, the full first season of which hits Netflix on Nov. 17, puts the punishing vigilante at the heart of the title as front and center as humanly possible, but there are multiple players and storylines threading throughout the latest trip through this corner of the Marvel Cinematic Universe — even if the likes of Matt Murdock, Jessica Jones, Luke Cage and Danny Rand are absent. What's more, if you're a fan of the Punisher comics, you're sure to recognize some of the names. May as well start with the basics. For those who don't remember, this guy's the Punisher. He's played by Jon Bernthal, best known until now as Shane Walsh on The Walking Dead, first seen in the Marvel universe thanks to the second season of Daredevil. He enters The Punisher having assassinated a former colleague named Schoonover (Clancy Brown), largely responsible for the deaths of Frank's family. As it turns out, the punishing is far from over. Outside of Frank, the most recognizable face in The Punisher, at least for Marvel-Netflix fans: Karen Page, played by Deborah Ann Woll, previously employed at Murdock and Nelson alongside Matt and Foggy, respectively. These days, she's a journalist. It's a new development since the last time Frank and Karen interacted during season two of Daredevil, though they formed a close bond over the course of their time together. She's a reliable shoulder for Frank to lean on — the Claire Temple of Punisher, if you will. Also known as "Micro," a well-known quantity among Marvel Comics readers. In Punisher lore, Micro is the man who often serves as Frank's eye in the sky, the Chloe to his Jack Bauer. Here, he's played by Ebon Moss-Bachrach, bringing some of the same twitchy energy he supplied as Desi Harperin on Girls. In Marvel's mature-readers MAX line, Frank and Micro became enemies for a time. It did not end well for Micro there. With any luck, it'll end better for him here. In a fun twist of fate, Ben Barnes of Westworld goes from Logan to Billy here in Punisher, playing one of Frank's only friends in the world: Billy Russo, a man he served with overseas during their time as Marines. When we catch up with him, Billy owns a private security firm, living a much more plush life than the one his old comrade leads. 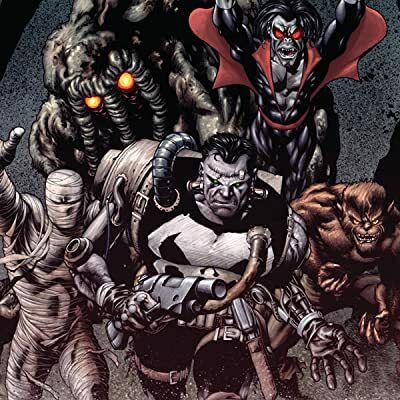 Fans of the comics certainly recognize Billy's name, and without saying too much more, a version of this character has already appeared in a live-action take on Punisher. How's that for a puzzle? A new character designed specifically for this series, Amber Rose Revah plays Dinah Madani, a fiercely dedicated Homeland Security agent who returns to New York after serving overseas. She's back in the states due to her razor-focused dedication to an investigation, one that directly ties in to our antihero. Bonus points awarded for the fact that her mother is played by the great Shohreh Aghdashloo. Played by Jason R. Moore, Curtis is one of the only people who knows Frank is still alive and kicking, making him an incredibly valuable ally for the occasional Punisher. He at least derives his name and origin from a comic book character who served in war alongside Frank. Whether or not they share the same terrible fate? To be determined. Like Madani, here comes another character created for The Punisher without any obvious roots in the source material. Actor Daniel Webber hops from his turn as Lee Harvey Oswald in Hulu's 11.22.63 over to Netflix for Punisher, playing a soul-sick veteran struggling to find his footing now that he's back from war. Outside of Frank, Lewis is the avatar for the show's exploration of PTSD and the cost of war, at the heart of some emotionally harrowing and visceral scenes. Paul Schulze makes his Marvel with a villainous turn as Rawlins, someone with a connection to Frank, and that's about all you need to know for now. If you wish to do some further digging into the name, you'll certainly eye some relevant information about how the erstwhile Father Phil (or Ryan Chapelle, if you prefer) fits into the greater Punisher picture. Just kidding, he's not in here. But it's no joke that Frank once died and came back to life as an undead monstrosity, ala Frankenstein's monster. Here, proof. The Frankencastle is about as likely to make it onto a future season of The Punisher as Frank donning Captain America's shield and moniker — which, yes, also happened. What's there to say? Comics! The Punisher arrives Nov. 17 on Netflix. Follow along here for all of our coverage of the new Marvel series.